Kemiko ‘Malay Tan’ acid stain adds drama to the hilltop views on this scored front porch. The mid-intensity concrete color works well with both the gray-tan and darker terra cotta stone tones. Finished with our clear exterior sealer. Winner of a 2012 ASCC Decorative Concrete Council Award - Second Place Certificate for Cast-in-Place Stamped, Under 5,000 SF. 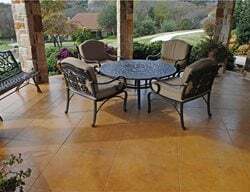 Stamped concrete patio with artistic crack control joints. This patio has an authentic Spanish style. Estudio Arqué combines tropical wood and polished concrete in may of its designs. They are looking to break into the U.S. market soon. Get this look using an ashlar slate stamp pattern, sandstone color hardener, medium gray release, and a brick border stamp with smokey beige and a medium gray release. 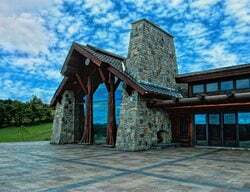 This project consisted of poured-in-place monument/wall caps, pool/spa coping, barbeque countertops, hearth, mantle, fireplace top and wood storage tops, all colored with CHROMIX® Admixtures for Color-Conditioned® Concrete. A different color of CHROMIX Admixtures was used for the main pool/spa decks and the patio area. All were sealed with CEMENTONE® Clear Sealer. The monument/wall caps, pool/spa coping, main pool/spa decks and patio areas were sand washed finishes. The barbeque countertops, hearth, mantle, fireplace top and wood storage tops were hard trowelled finished. All control joints and decorative joints were saw-cut. 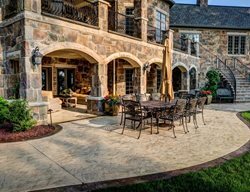 A 50' x 40' stamped patio with a heavy stone texture, fieldstone and cobblestone pattern. Scored patio using Kemiko color. Get this look using Chaotic Pigments in honeycomb and fieldstone stamps. 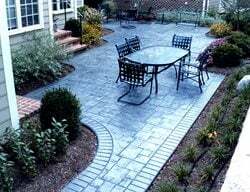 Get this look using an Old English Slate stamp pattern, from Increte Systems along with Increte's Philly blue color hardener. Creative Construction by Design, a Corp. Winner of a 2012 ASCC Decorative Concrete Council Award - First Place Certificate in Multiple Applications. Access was difficult on this lakeside project, which included retaining walls, a patio and a polished basement floor. The sloping site forced the contractor to pour a majority of the project with a concrete bucket on a skid steer. Additionally, some of the concrete was poured manually with a wheelbarrow and five gallon buckets. 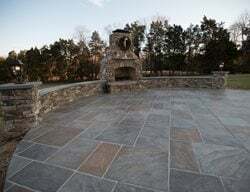 Originally, stamped concrete was specified for this patio, but in the end they went with craftsman finished integrally colored flatwork with interweaving bands. The retaining walls were made of vertical concrete with integrally colored wall caps. Winner of a 2012 ASCC Decorative Concrete Council Award - First Place Certificate in Concrete Artistry, Under 5000 SF. This project consisted of 800 sq. ft. of new concrete poured to extend a 150 sq. ft. existing pad into a beautiful outdoor area. The new section included building 2 sitting walls that followed the curve of the outside edge of the patio. A vine-like design flows throughout the space and wraps around the sitting walls. A black acid stain heavily diluted was used as the base color with a full strength black acid stain on the vines and a slightly diluted black on the leaves. A dark walnut acid stain creates the illusion of shadows underneath the vines and leaves. The patio was sealed with a UV stable solvent-based sealer. 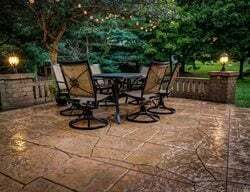 This patio is actually a concrete overlay that mimics limestone.Get this look with ArcusStone. 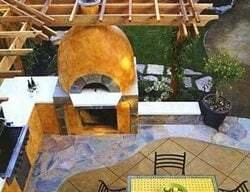 This Los Angeles concrete patio is very modern in design and style. The fire pit makes an inviting feature and sitting area. See more modern concrete patios. Patio meets pool surround, both stained with a combination of acid and dye stains. The patio is cut in a 30” diamond pattern. 2009 Award for Residential Architectural Hardscape – Progressive Concrete Works Inc. installed the pool and patio areas of a local Arizona residence mirroring the beauty found in the natural Arizona landscape. The project is noted for the red and brown hues and natural textures. 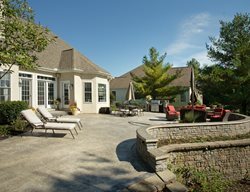 This is roughly 3,000 sq ft of seamless stone stamped patio joining the new stone deck addition to the pool and new pool house of this Kentucky home. It uses Scofield oyster white color hardener with cream beige release. The nautical star was stained with smith water colors, as follows from darkest to lightest: dark chocolate, bark brown (border only), amber, and fawn. The steps were poured using high strength bagged sakrete and stamped with the same colors and stamps as the patio. Get this look using a seamless stone stamp, Scofield's oyster white color hardener and a cream beige release. 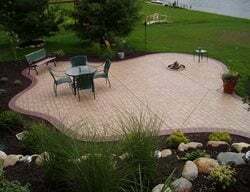 John Schimmel of John's Cement in Milford, Mich., likes to share with his clients unique and simple ways to personalize their concrete projects. This patio was 600 square feet with a series of steps leading down to it. Schimmel helped create a free-form design suitable to accommodate the client’s activities which included installing a fire pit at one end. Get this look using Proline's ashlar slate stamp, Brickform's beige with walnut release (field), and Brickform's ebony acid stain (borders). This residential porch features a Roman Ashlar Slate pattern overall and a hand cut border in Roman Ashlar Slate. The colors used were Miracoat’s Mirastain II Dolphin Grey as the base color and Neptune Grey as the highlight color. A meandering patio design with flagstone stamping in the field, and a stained border to give it an antiqued-look. 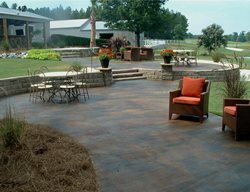 This patio was stamped with a pattern and colored using a terra cotta release. The borders were engraved into the concrete and acid stained in walnut. 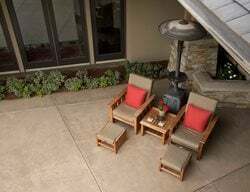 A custom fire pit was also fashioned as an integral part of the patio. This striking architectural concrete patio was created using a Belgian block stamp for the borders and radius lines that extend around the compass design and the Grande slate stamp for the interior triangles and colored using grey tones. This patio has an engraved ashlar slate pattern as well as a swirl design. The coloring was achieved with pigmented dyes. This new residential patio was stained with Maylay Tan and Cola, then sealed with a wet look sealer. 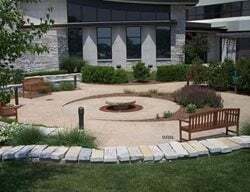 This intriguing round patio in a public park in Columbus, OH features integrally colored concrete with decorative saw cuts with a broom finish. 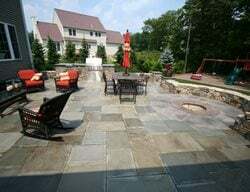 This tranquil patio in a flower rock pattern at a residence in Bridgeville, PA was created using a stamp and colored with pewter and a charcoal release agent. Colored salt finish with flagstone borders. A patio for an upscale retail center in Austin, TX features concrete with integral coloring. 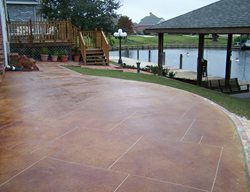 Read more about how decorative concrete was used in this patios project. A cement-based overlay, random saw cuts and hand staining create the look of natural stone in this home's courtyard. Get this look using Sure Spray overlay from SureCrete, and EcoStain from SureCrete in a combination of burnt crimson and safari tan. This patio was designed to look like an outdoor rug. Modello stencils were used to create the intricate designs. 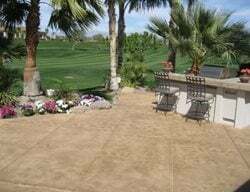 Read more about how this concrete patio was created. Seat walls and steps help to define this outdoor seating area that surrounds a water fountain. Read more about concrete seat walls. This exterior overlay was stamped with a flagstone pattern. This striking new poured concrete patio was finished with a hard troweled finish in natural grey. Miracoat’s Mirastain II was applied in Ivory Cream, Harvest Gold, and Adobe.